MXIe Express Bus Expander | Marvin Test Solutions, Inc. The MXIe PXI-Express Bus Expander allows for direct control of PXI-Express systems from any PCI Express slot in a desktop computer or server. MXIe-Express configurations are available for supporting both the x1 and x4 PCI-Express lane configurations. Either lane configuration can remotely control one or two PXIExpress chassis. The MXIe-Express technology utilizes a high bandwidth link that is transparent to software applications and drivers, providing the ability to use high performance desktop computers or servers to control PXI-Express systems. Since PXI-Express is based on the industry-standard PCI-Express bus, the MXIe-Express Bus Expanders provide a transparent link where all PXI and PXI-Express modules appear to the user as if they were PCI or PCI-Express boards within the computer itself. However, with PXI technology, users benefit from an increased number of slots, power and cooling per slot, module selection, and synchronization features. The MXIe-Express employs a high speed serial link to control the PXI-Express chassis. Interfacing cables for the MXIe-Express are available in 1, 3 and 7 meter lengths for the x1 interface and 3 and 7 meter lengths for the x4 interface. The MXIe-Express is available in several configurations. A x1 lane configuration supports a sustained data throughput rate of 192 MB/s and the x4 lane configuration supports a sustained data throughput rate of 798 MB/s. Optionally, the x1 and x4 configurations can control two PXI-Express chassis by utilizing a two-port, PCI-Express interface card. 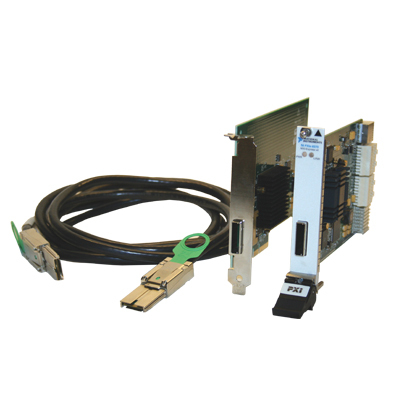 The basic MXIe-Express kit consists of a single port PCI-Express interface card, a 3 meter interface cable, and a PXI-Express interface card. Individual kit components may be purchased separately for spares or to meet your specific requirements. Compatibility Fully compatible with PXI Express Hardware Specification 1.0 and PICMG CompactPCI Express EXP.0 R1.0 Specifications.